Greenland has to be one of the least hospitable places on this planet. Not as bad as the poles, or the inner Sahara, but when looking at a globe the huge white island in the North Atlantic is not where you would point and say “there must be people living there, it looks so inviting!” You’d also wonder why the place is called “green land” when it’s almost completely white, but this is was probably an early case of clever marketing: Erik the Red, exiled from Iceland and settling down in Greenland may have picked that inviting name to attract more settlers. The things you learn from boardgames. But despite its inhospitality, Greenland was home to three different people in the middle ages: the primitive Tunit, the pre-Inuit Thule and the Norse brought there by Erik the Red. 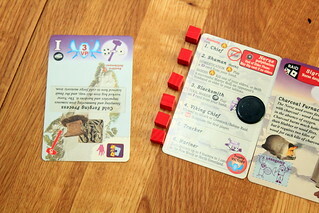 Those three people compete for survival in Phil Eklund’s card and dice game Greenland. 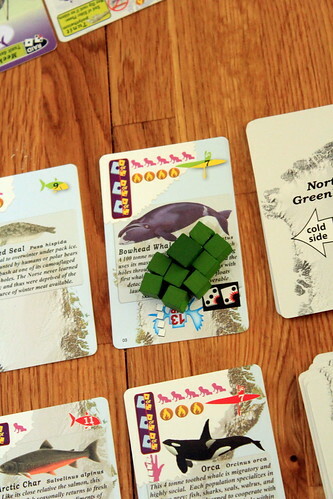 In this game, the island of Greenland is represented by two rows of Biome Cards, each card shows either a prey animal or, more rarely, an invention to make life in Greenland easier. The Tunit and Thule share the North row of cards as their home, the Norse live on the South row. To cross from one row to the other they all need sleds or boats. Those cards are the hunting grounds for the wooden cubes acting as tribe members. Most of your cubes will be hunters and will go find food on the cards, but each player also starts the game with six Elders, each bringing a different skill to the tribe, and all of them important. 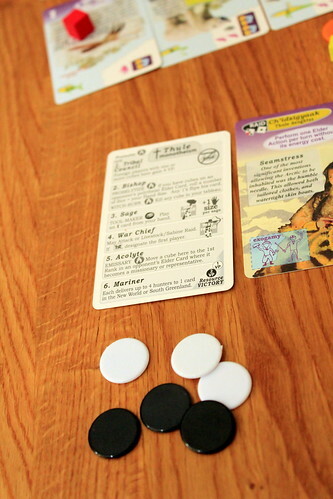 A game of Greenland lasts ten rounds, counted by a prepared stack of event cards, and each round starts with one of those event cards. They rarely bring anything good. Come on, you’re living in Greenland, you didn’t expect event cards to bring you a rich harvest. The worst that can happen is probably Decimation, killing of half your hunters in an instant. This mechanic covers diseases that kill of your people if your population is too large as well as internal feuds that can only be prevented by having a Rank 1 Elder, called a Chief. Not much better an event is Elder Die-Off where you roll a die and remove an Elder of the appropriate rank and lose his abilities. Some other unpleasant things can happen on event cards, but the most noteworthy one is Global Cooling. Since we have the opposite problem, we don’t think cooling is a big deal, but each time it happens a card is moved from the warm side of the Greenland cards to the cold side, where hunting is much harder. If the climate cools too much, your people will starve. The only good thing that can come from the event cards is the occasional Viking trade ship that has tools or weapons to sell to the player bidding the most ivory. When the horror of the event card is over, you assign all unused cubes to their job for the round. Most cubes usually go hunting on a Biome Card, but you can also promote a hunter to an Elder, send your hunters to raid a card in another players tableau (if you have a Rank 4 Elder or War Chief) or defend your own cards against such a raid. Greenland may look large, but the parts suitable to hunt are not all that big and you’ll often find yourself on a Biome Card together with another player. In that case, before the hunt starts, you can try your diplomatic skills. To convince the other player to leave and let you hunt alone, you may exchange cards from your hands or tableaus, resource chips, make agreements about future turns and hand over your daughters in marriage. Each daughter, another type of cards, gives her tribe a special ability, like an increased hand size or the chance to re-roll some dice, and her husband’s tribe gains the same benefit. The player with fewer hunters on the card has a slight advantage in these negotiation because he would roll first if both players stayed, and if he hunts successfully the other player’s hunting party will go home empty-handed. Of course, the larger party might also resort to the other kind of diplomacy and kill off the competition – or try to, at least, only a roll of one will kill an opposing cube. After diplomacy, it’s finally time to hunt. For each cube on a card, its owner may roll one die. On a card in warm climate, a one or two is a success, in cold climate only a one hunts successfully. Depending on the size of the prey, you need one to three successes, and the more dangerous types of prey also bite back. Rolling certain numbers shown on the card will get one of your hunters killed. Even with the re-roll abilities some Daughters, Elders and Tools give you, hunting large pray on the cold side is a challenge and you should bring a large group of hunters. What you get from hunting is, first of all, food. Food is handled easily in Greenland, getting food from the hunt lets your tribe raise children, so you take fresh hunter cubes from your supply and that’s it. In addition to food, some cards show a hand icon, meaning that you can take this card to your hand if you rolled doubles or triples, as shown on the icon. Those cards represent tools your people invented or animals they domesticated. Using an action of one of your Elders and paying resources, you may put this card into your tableau later and gain its benefits. Finally, a card can show the antlered trophy icon. Meeting its requirements – again that’s rolling doubles, triples or even quads – lets you take this card as a trophy and add it to your tableau where it may or may not be worth points at the end of the game.This is where things get really interesting. First, cards taken as trophies are not replaced. When taking cards as hand cards, a new one takes their place, but taking trophies permanently reduces the number of Biome Cards. This makes Greenland a very tight game towards the end. There may be a lot of space at the start to avoid opposing hunters, but once a few trophies have been taken you’re forced into negotiations. Second, the trophies only may be worth points at the end of the game. All players start the game with their people following the old, polytheistic religion. If they still do that at the end of the game, the trophies are worth points. However, a player can choose to convert to monotheism (meaning Christianity) at any time, all that’s needed is for him not to have any living Elders in his tribe. The old ones always oppose change. Monotheistic players get nothing at all for trophies, but they gain points for their iron and ivory, plus they may send missionaries to other players for points. But the impact of changing your religion is not simply that you score points for different things. Okay, it mostly is, but that change has a deeper meaning for how you play. Being polytheistic encourages a high risk, high gain play style. Most trophies worth taking, especially whales with their 13 points value, are hard to catch and have a good chance to kill some of your hunters. Monotheists gain their points in smaller chunks, one point per chip of ivory and two for iron, but getting those chips is easier and rarely lethal. If and when to change your religion is the one key decision in Greenland and depends on many things. Piece of advice: when all the whales have gone to the cold side, they’ll be close to impossible to hunt and you’re better off turning to monotheism. But be careful, because once you join the Vatican Crew, there’s no going back. Turning to Christianity just a round before fresh, valuable trophies turn up can be embarrassing. But while you can’t go back, you can try to convert other players’ people against their will, with a missionary and a bit of luck. And suddenly, their trophies are worth nothing, too. It’s this religion part and the diplomacy that makes me really enjoy Greenland. If you play it as a simple game of sending out your hunters and rolling dice, chances are you won’t enjoy it much. Fortunately, as Greenland grows colder and the available prey disappears, playing like that doesn’t work any longer, you’re forced into conflict and negotiations with the other players. The shrinking game “board” really works here, Greenland gets pretty crowded towards the end. The other big thing is your religion, a big decision that has a huge impact on your strategy, and thanks to different events and biome cards every game neither religion is strictly better than the other, it all depends on the situation. But with all the tactical and strategical decisions, Greenland is a game with cards and dice and thus contains a certain amount of luck. No matter how well prepared your hunt is, sometimes you’ll only roll threes and fours on the hunt, and then your people catch a terrible disease on the next round and your tribe is suddenly close to extinction. Thematically, that is very appropriate of course. Greenland is a merciless place, and Greenland is a brutal game of survival. Sometimes you die, even if you did everything right. I know that some people will be put off by this, that’s why I say it here, but I also say that it works for me. Reading about all the options you have in Greenland, it’s easy to expect a giant box with many pieces. Nothing could be further from the truth, the game comes in a small box that travels easily, and it contains a stack of cards – not the prettiest, to be honest – some standard dice and some wooden cubes and plastic chips. That’s it, and it just goes to show that you don’t need a lot of paper and plastic to make an engaging strategic game. By the way, if you really enjoy Greenland, you might be interested to know that Sierra Madre Games have announced a prequel titled Neanderthal for this year. Terra Mystica was the first game by German publisher Feuerland Spiele last year, and to say that it turned out popular is a bit of an understatement. It’s an entirely peaceful fantasy game about colonizing the world, there is no direct conflict, no destroying opposing settlements. But space is very limited and you’ll soon be standing on everyone’s feet. Even more so because the game punishes you for being far away from everyone else. So, did it deserve the rave reviews so far?